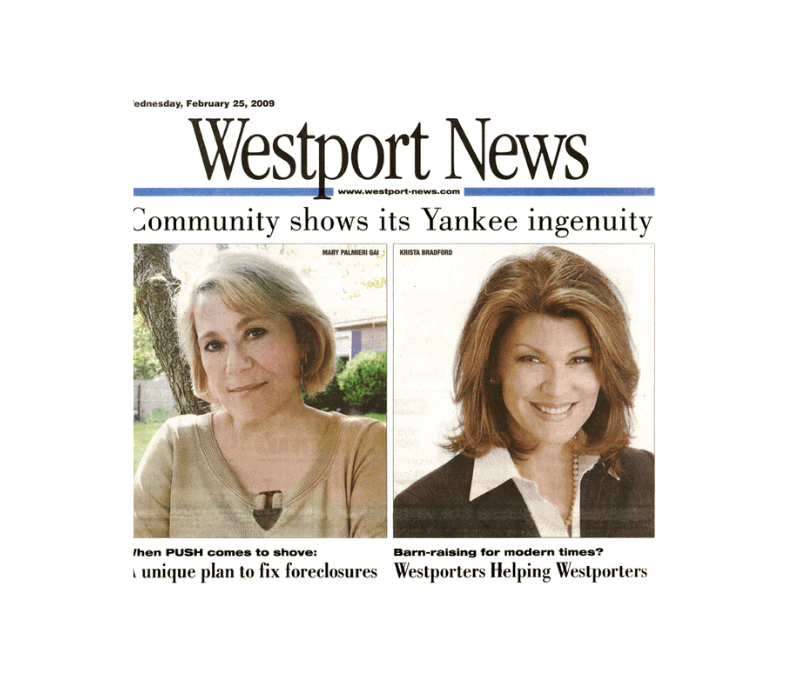 At the height of the financial downturn, the Westport News featured The Good Search CEO Krista Bradford on its front page , praising her ingenuity in helping unemployed executives. An executive recruiter, Krista formed a Facebook social media group called Westporters Helping Westporters to enable neighbors to assist unemployed executives living in her town. The article was written by Anthony Karge of the Westport News is featured below. Download a PDF version of the article to read. Full text of the article is copied below. Back in the “good old days,” as Krista Bradford described the time well before she was born, there used to be barn-raising events where the entire community would work together to help out a neighbor. She wants to foster that mindset in Westport and is utilizing social-networking tools like Facebook and Linkedin with the goal bringing people together and lessening the pain of the recession. To do this, she created a “Westporters Helping Westporters Network” on those Web sites. 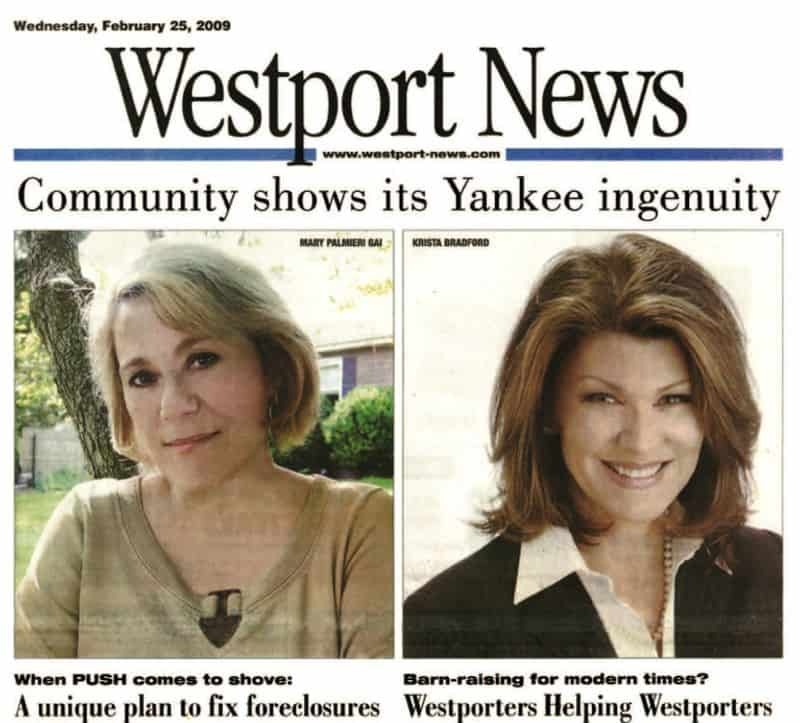 “There are no better networked people than those living in Westport, and it seems insane not to leverage it,” she said. The idea to do something to help people came indirectly from her daughter, Katie Cioe, who is a sophomore at Staples. It seemed like everyday her daughter would come home with news about a parent who had lost their job, so Bradford decided to bring the issues to the Internet. Bradford doesn’t limit the group to one particular need. Job hunting, supporting struggling businesses and other problems all fall under the group’s umbrella. The goal is that people who join will become connected in ways that may boost business at a store, get a foot in the door in a job hunt or simply obtain or give out valuable advice. “The thing I thought that was cool about this is that it’s an opportunity for neighbors to help neighbors,” she said. The problems of the difficult job market are particularly close to Bradford since she owns an executive search firm that helps companies fill top positions. She explained that many companies are flooded with resumes, but with a little help from a friend on the network, a person that’s out of work might land a job. “How much effort does it take to put in an introduction?” she said. “All it takes is a phone call.” Recently, she learned that approximately a half-dozen seniors at Staples have had to change their college plans due to their parents’ finances. “We’re Westport,” said Bradford. “That shouldn’t have to happen.” “When somebody goes unemployed in Westport, it doesn’t affect them,” she added. “It affects the future of their children.” Once she heard about the struggling students, she set up a page on Facebook to accepts donations for the Staples High School Tuition Grants committee in order to aid students who are struggling financially. “If people can give a dollar $20, or give up a latte or a pedicure, then it’d help,” she said. When somebody loses their job and experiences financial difficulties, Bradford said that it’s difficult for some people, especially Westporters, to ask for help because the ordeal can be so damaging. “Westport is a place where people are reluctant to come forward when they’re having problems,” she said. She hopes that people will see that there is no shame in suffering, but if people are still concerned about privacy, they can message individuals of the group rather than posting their problems for everyone to see. Local business owners are also encouraged to post. “I put it [the group] up, but I don’t own it,” she said. “Everybody is free to post” As of Monday, there is a modest following of 15 members and several discussion topics on the board. Also, $125 has been donated for tuition grants. Bradford hopes that more people will pitch in to help as the group becomes established, even if isn’t out of generosity.”There’s a big self interest to help too,” she said. She explained that if somebody doesn’t want to help simply out of kindness, helping people find jobs and stay in their homes will help maintain property values and benefit everybody. No barns have been raised just yet but Westporters Helping Westporters is working toward that kind of communal experience.